Discover a unique variety of living options at Forest Hill, a Continuing Care Retirement Community (CCRC) offering full-service retirement living on Monterey Peninsula. Just minutes away from parks, ocean-side trails, and the many shops, downtown Pacific Grove, golf courses, and tennis courts our residents have access to all kinds of activities. It’s easier to make a decision for your future when you have all the information you need and we are here to help. 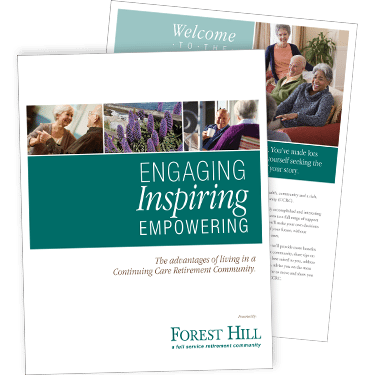 Download Forest Hill’s Senior Living Guide by completing the form or contact us directly at 831-657-5200.